The United States, Marines have a proud tradition, dating back as an institution to 1775, and operationally well before that. Marines are deployed over the sea in naval vessels in order to respond quickly to emerging threats. Historically, marines have had a reputation for being first responders in perilous situations. 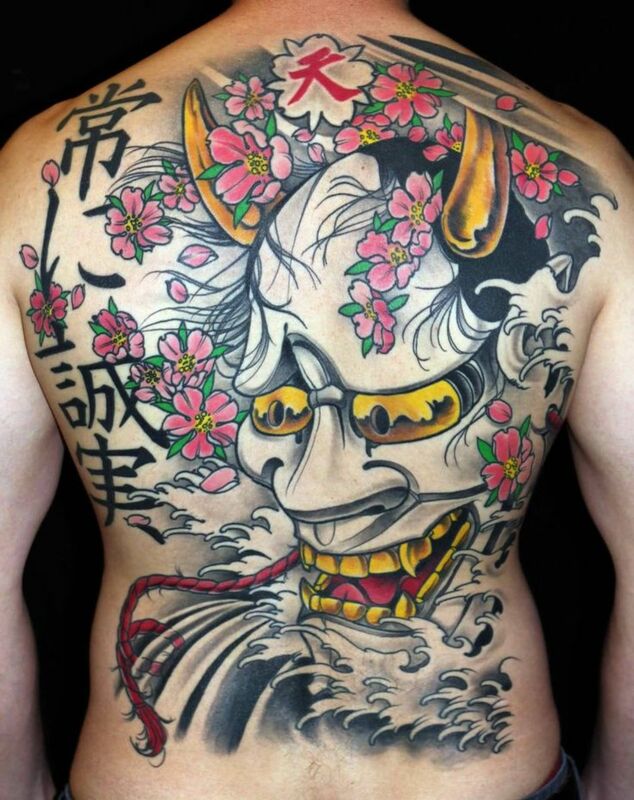 Thus, their attitude and persona include a certain swagger, which is also expressed in tattoo art. Marine tattoos seem to always include "USMC" as part of the image. The word can look great with awesome fonts or other elements which are used to enhance the lettering. 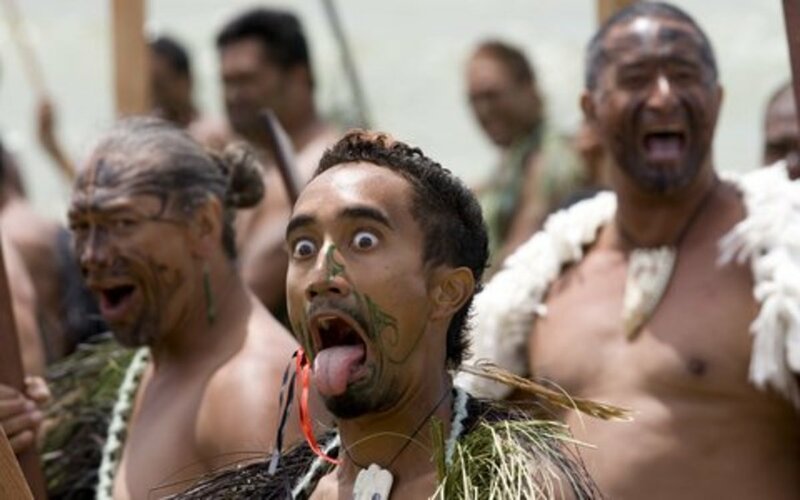 Other elements can include the bald eagle, bulldogs, knives, and combat scenes. 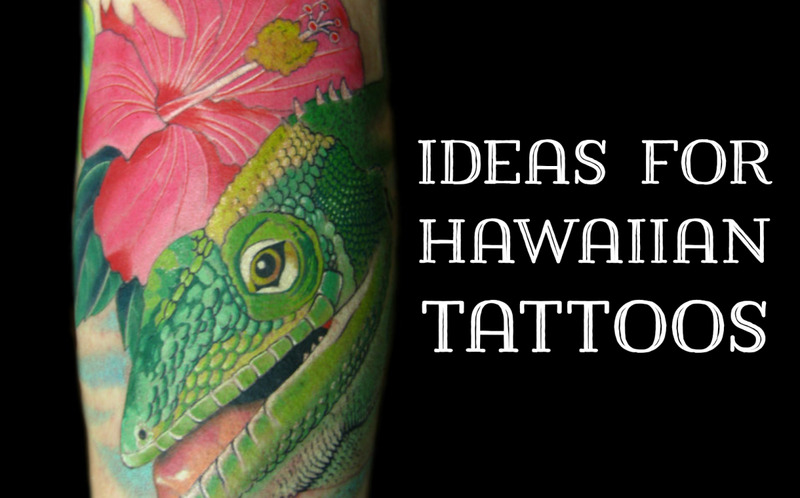 We'll now look at several Marine tattoo designs to help generate some ideas for your art. 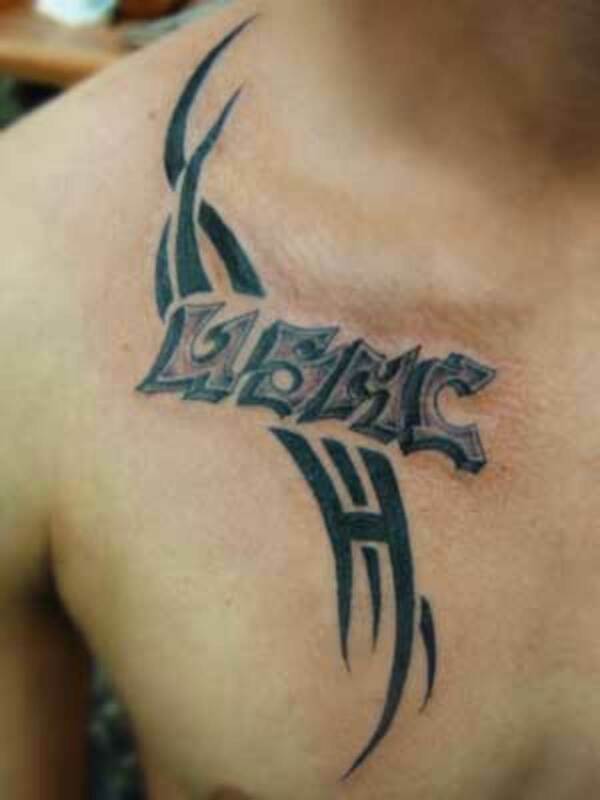 We'll start off with this awesome tribal Marine tattoo extending from the neck down to the chest. The tribal design is very well done, and works with the USMC lettering nicely. 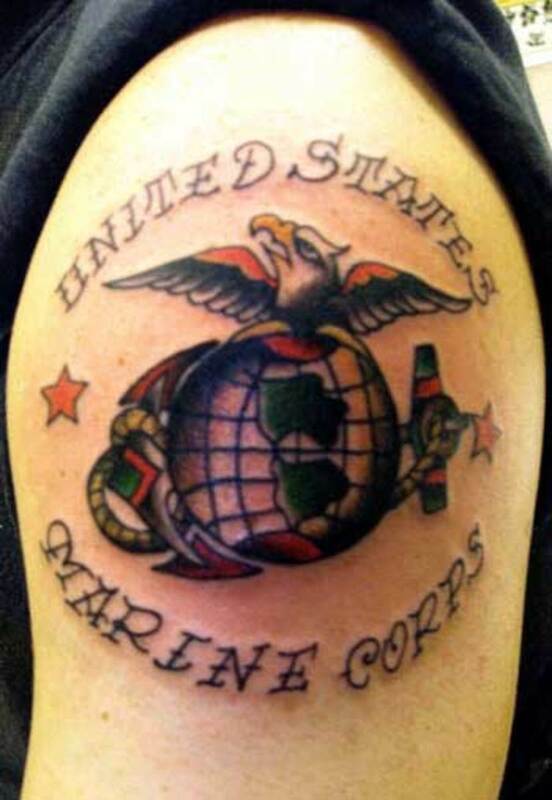 I only wish the tattoo artist, or the person requesting the design, would have lightened up the inner parts of the letters "USMC" so we could see them a little clearer. 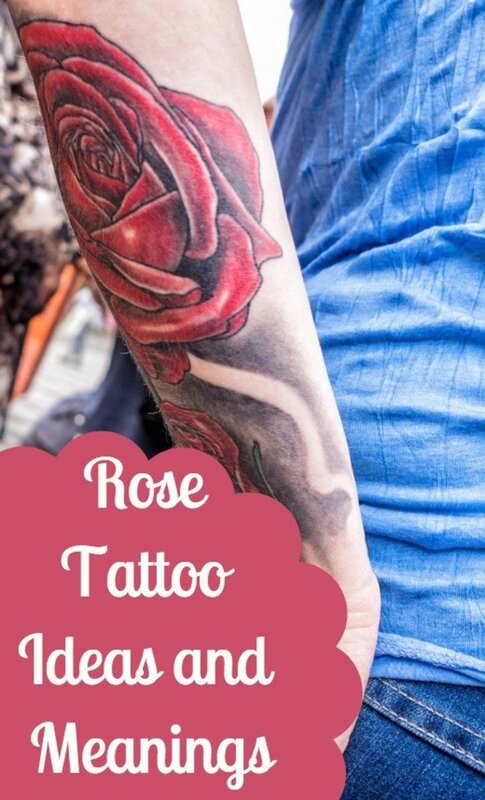 Even with that it's still a great tattoo. 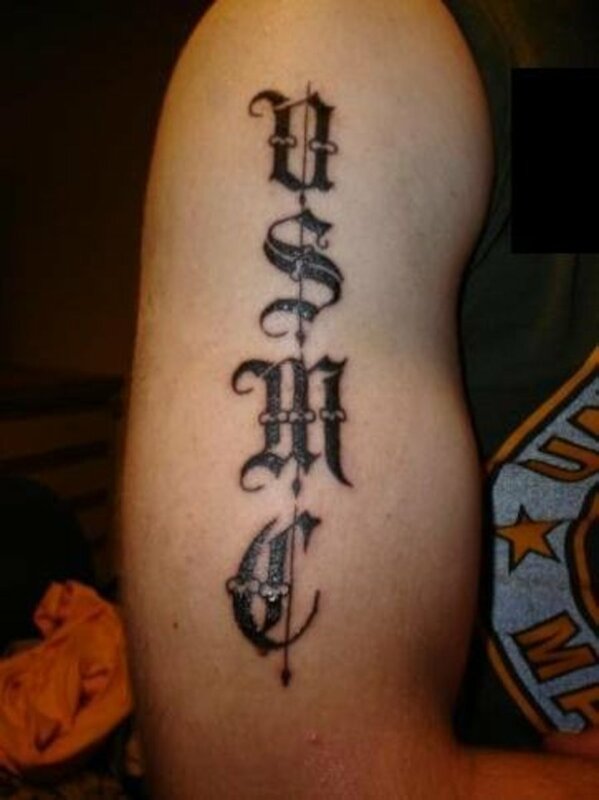 Tattoos of words or phrases that try to express themselves by font choices aren't usually that impressive to me, but this one saying "USMC" is fantastic. The straight line going through the lettering keeps it all tied together while the quality of the lettering itself is awesome. The font combines sharp points and curves to generate a terrific effect. 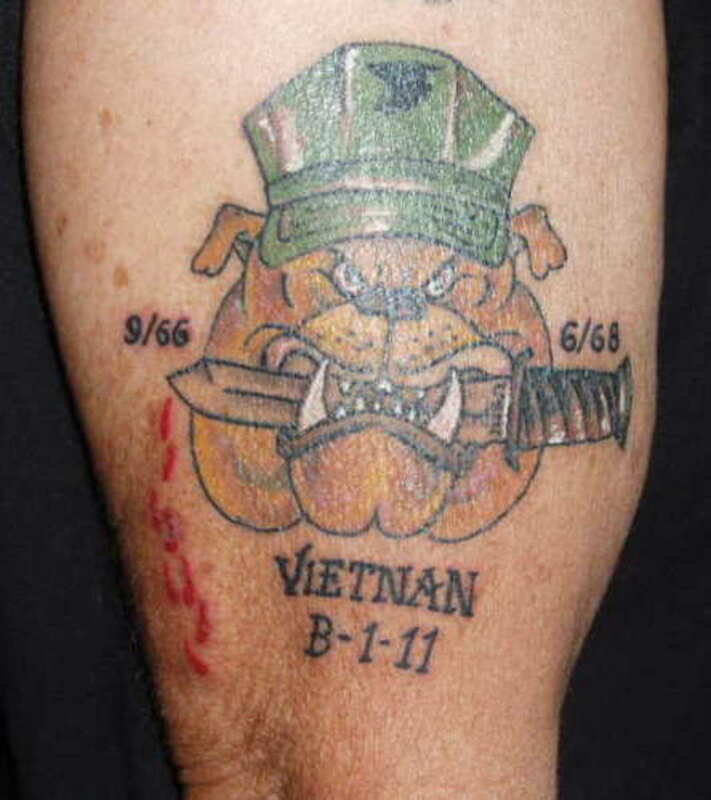 The bulldog mascot for this Marine tattoo was a good choice, especially with that green cap, and the knife clutched in the giant teeth of the dog. This was presumably a memento of someone's tour of duty in Vietnam. And unless it's an inside joke of some sort, it's too bad the spelling of Vietnam was incorrect. For those who may not know, this tattoo shows the insignia of the United States Marine Corps. Interestingly, it isn't complete, as normally it would include the eagle holding a banner in its beak, with the words "Semper Fidelis" on it, which means in Latin, "Always Faithful." 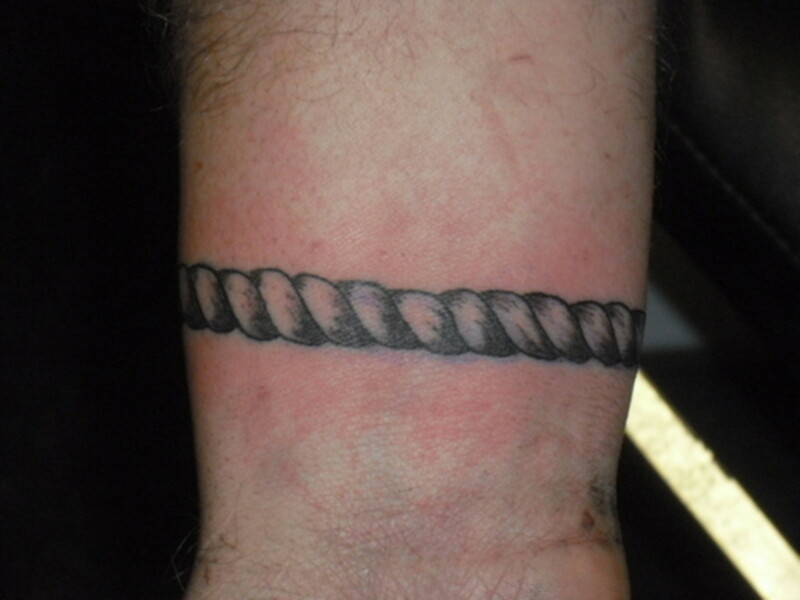 That would have been much better in my opinion, but this is still a nice-looking tattoo of the Marine emblem. 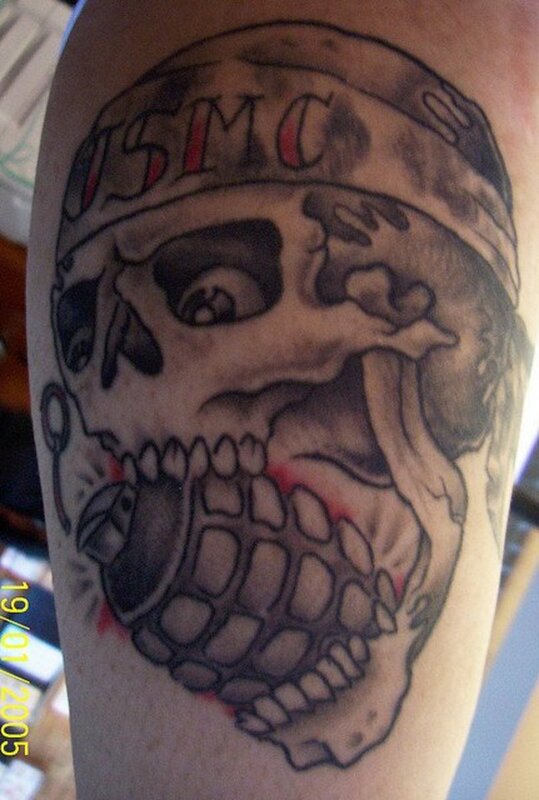 This is a pretty interesting tattoo design of a skull wearing a Marine helmet with a grenade clenched in its teeth. I'm not 100 percent sure what message it attempts to convey, other than the probability a Marine will do whatever it takes to get the job done, even if it means death from a grenade. While the eyes in the skull look pretty cool here, adding a nice effect, it may have looked even better with the dark, empty sockets that usually appear in a skull image. 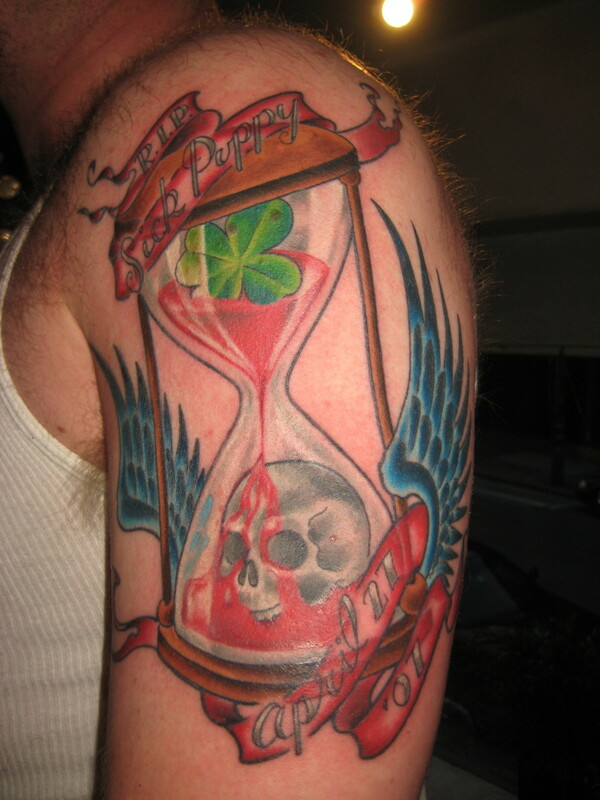 Even so, it's a good, edgy tattoo design for a Marine wanting to make a statement. 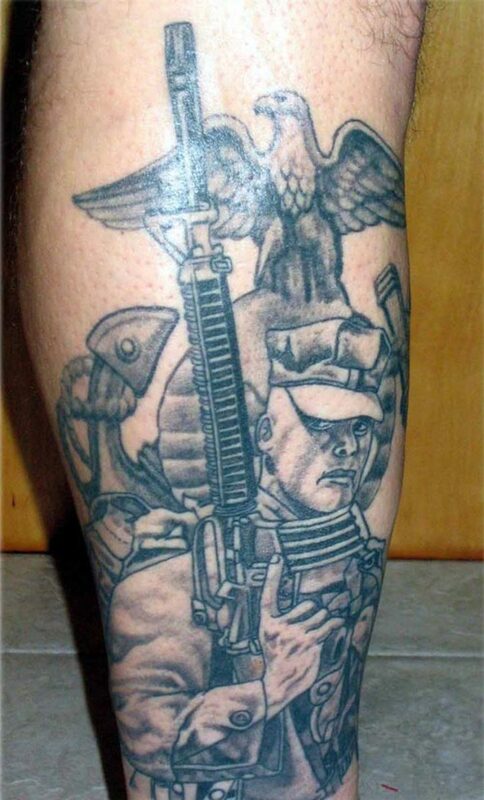 Here is an awesome tattoo of a Marine on patrol in a potential combat situation. His backdrop includes the Marine insignia, as confirmed by the eagle, the globe, and the anchor (which represents the Navy). The detail of this tattoo design is amazing, with the gun, hat and uniform all looking fantastic. But the best thing is the sense this Marine is walking by right in front of you, with his eyes watching you as he passes. Great effect! The United States Marines have a long history of pride, confidence, and faithfulness in serving their nation. 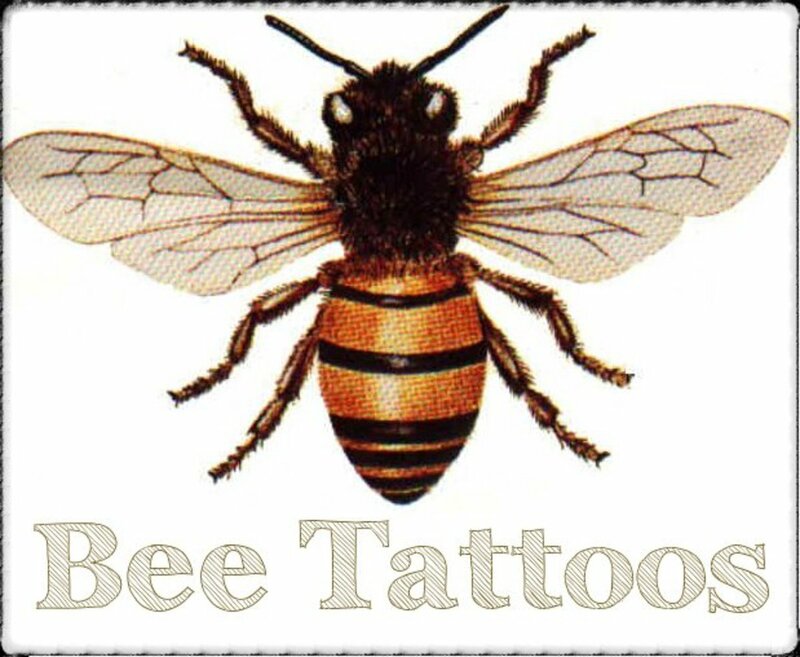 Those emotions translate well into tattoo designs. That pride would have little meaning if it had not been backed up with action and results through the years; fortunately, that action is a historical fact that continues to this day. No wonder USMC tattoos are worn with pride.